Landlords that the Property Hawk website even if only to download a free tenancy agreement will have come into contact with our free property management software, PM 3.0. The PM 3.0 sits at the heart of the website, enabling landlords to manage their lettings business anywhere using the principles of cloud computing. When a landlord signs up for a free tenancy agreement they will automatically be given their own property management account even if only to use it to download and save a tenancy agreement. The advantages for us of using the cloud is that we can constantly evolve the property management software without users having to download endless updates and patches. So if we recognise something needs changing, we can change it within hours. We have recognised that some landlords were finding the whole experience of editing their rents through PM3.0 a little confusing. To help clarify the situation we have relabelled the actions of the Rent screen. To edit rent, just click ‘Rent’ button on the ‘Summary ‘ screen. You will then be taken to the screen showing Outstanding Rental Payments (ORP’s) against each of your tenancies. To add in rental payments just click either the ‘Tick’ icon againt a tenancy to record that a full rent has been paid or the ‘Edit’ icon to be taken to the full rent edit screen. 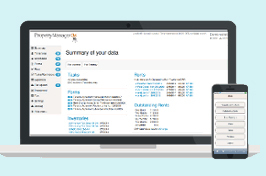 Here users are able to record in more detail their rental payments against the full history of the tenancy, including multiple payments and payment methods. Another area of confusion was users establishing multiple accounts. PM3.0 was designed to allow users to have multiple property management accounts but we have recognised that occasionally this causes confusion. We therefore now have a multiple accounts button on the ‘My details’ screen. This should allow users to access their relevant account. We now have the Property Hawk forum which enables users of PM3.0 to post their questions and ideas about how the property management software works. So if you do have any questions then post them to the forum and we will answer them there. This way it helps the whole Property Hawk community, share PM3.0 user questions and answers. We are evolving with your help so don’t forget to get involved.